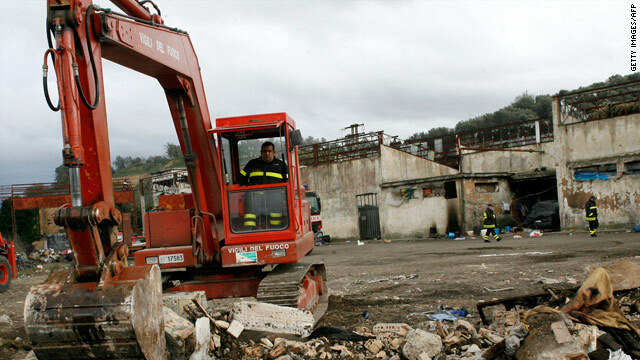 Firemen on Monday pull down a factory where immigrant workers were living in Rosarno, Italy. (CNN) -- The message blaring out of the speakers on the van was stark: "Any black person who is hiding in Rosarno should get out. If we catch you, we will kill you." "We have not witnessed such protests in a long time," said Flavio Di Giacomo. "There were several thousand, but I don't know exactly how many people were involved." Interior Minister Roberto Maroni got involved Friday, declaring an "immigration emergency" and forming a task force under the authority of regional police to guarantee public order. It was the shooting of an African migrant that sparked two days of protests, Iddris told CNN by telephone from Italy. He said the shooting was unprovoked. Police said they were investigating the circumstances of the shooting. "About 2,000 people came -- all of us," he said. "It started about 6 or 7 in the evening, a few hours after he was shot." That's when they heard the warning. "People took a van, an information van with speakers, saying any black person who is hiding in Rosarno should get out, if they catch anyone they will kill him," Iddris said. Iddris -- who is originally from Sudan and has been in Italy for about 18 months, first as an asylum seeker and then without legal documentation, and who picks oranges in season -- said police arrested another 10 to 20 people at Friday's demonstration. Italian press reports said the demonstrators had burned cars. Later on Friday, Iddris said, police arranged for buses to move the Africans away from Rosarno to another village. But the new location was no safer, he said. Police had to keep locals and migrants physically separated Saturday. "They said they would take us to another place. They said it's dangerous now for blacks to stay there," he said. Hundreds of people were driven north to Bari on Italy's east coast and Naples on its west coast, Iddris said. He was on one of six buses, each with 45 to 50 people, taken to Bari. "Right now we don't know what is next," he said Monday. "An immigrant is a human being, different by background, culture and tradition, but a person to be respected," he said. "Violence must never be a way to resolve difficulties," he said, urging people "to look at the face of the other and discover that he, too, has a soul, a story and a life. He is a person and God loves him just as He loves me." The migrants who demonstrated last week "were exploited. They were just paid 20 euros (about $29) per day and they lived in slums, the same as slavery conditions. A few months ago in (the southern Italian region of) Campagna we discovered a similar situation. It's unfortunately a reality in many places, especially in southern Italy." Italy is one of the top European destinations for migrants, the migration organization's figures show. More than 3.6 million legal migrants live in the country -- 6.2 percent of the total population -- and Italy has the European Union's highest annual growth rate of migrants, along with Spain. It's hard to know exactly how many illegal immigrants there are in the country, Di Giacomo said. "It is not controlled in any way. They change the area where they work because of the season of the year -- oranges in the winter, tomatoes in the summer," he said. "With economic migrants, many of them arrive with tourist visas and overstay seeking work. They can arrive in so many ways," including paying traffickers thousands of dollars to smuggle them into the country. Not all the workers involved in the demonstrations were undocumented, he said -- but the line between legal and illegal can be porous. "Some have lost their jobs, and in Italy if you lose your job you have six months to find work or you become illegal," he said. Italian media have speculated that the Mafia was behind the shooting that triggered the violence. But Di Giacomo said it was not important whether they were or not. "We don't know if the Mafia is involved, but the point is not really the Mafia," he said. "The point is that the conditions for these migrants are so inhuman that they can lead to some violent reactions."